In the books the marriage between Robb and Jayne Westerling was a plot arranged by Jayne's mother and Tywin Lannister. Do you think that the plot is somehow written to the series as well? I think that would be too juicy a detail to be left out. Thinking about Tywins dislike (or so we think) with hookers, maybe she's just a prostitute purchased by Tywin Lannister to seduce Robb. Also in the series Talisa's last name Maegyr is the same as one of the rulers of Volantis. Could this just a coincidence. Umm, not sure if it's quite that simple. I think Jeyne's mother Sybil only plotted to Tywin after Robb married her, if you discount the Jeyne/Love Potion theories. But yes, I wouldn't find it to be an asspull from the show if Talisa is a spy. They've dropped subtle hints that could be taken as either hints if its right or overreaching if wrong. No Talisa is no Shae. I think D&D definitely wanted Robb's relationship to be true love. I think that Talisa will be killed at the RW also, unless they do a plot twist with her. 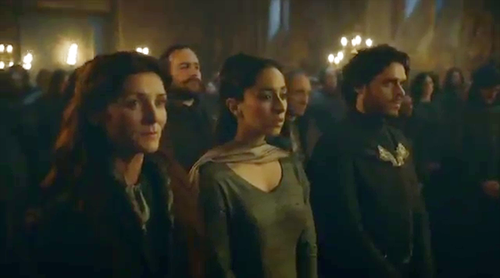 She's in the pictures from the RW that have been on the internet for a while, alongside Robb and Catelyn. 2 and 3 could lead to a variety of options, she could replace fake-Arya or be the 'Frey' Catelyn kills. Guess we shall find out soon enough. She told Robb she was from a noble family from Volantis, I'm sure. If the Jeyne Westerling being pregnant theory is true then she won't be killed as Robb having an heir would turn the tides. Didn't Jayne Westerlings mother say that she gave her anti-fertilyt drugs to keep this from happening? I think if the Jeyne-swap theory was true they would have kept Talisa at Riverrun in the same way Jeyne stayed there. Her being at the RW I think confirms her death. I think it's 75% likely that she will be killed at the RW and 25% likely that she will be captured, ransomed back to her family, and get looped back into the story when other characters start heading for Volantis. I'm kind of hoping for the less likely scenario, because then at least there will be SOME earthly point in her existence. Yeah unless Jeyne has bionic fertility those theories are probably wrong. Although I guess that stuff still happens today with modern birth control, so who knows. I wonder, which one would people prefer? As much as I want Talisa to be removed from the show yesterday, I really like the idea of her replacing fake-Arya and to interact with Theon. IMO, they need to start introducing some of Robb's bannermen in the upcoming episodes in order to make the RW more poignant. It wasn't just Robb and Cat who were killed. -If she attends the RW and dies, then it means that Jeyne definitely is not pregnant, as then I really don't see any way to tie the show with the books with the possibility of having a new Stark boy in the saga. It could also mean that Jeyne would have a girl. -If she attends the RW and survive/doesn't attend, which I believe is what will happen, then we'll still be in the dark when it comes to Jeyne. -If she's a traitor, I will very disappointed and confused, even if Talisa is a spy-but-still-in-love. I've seen the video about Talisa being a spy, and while it's quite interesting, I'm just hoping it's a mixture of coincidences and poor writing. I see the point of replacing Jeyne with something more exciting, as it probably wouldn't have worked very well on screen what happened in the books, but I think it just went wrong due to various reasons. If Talisa does end up being a spy,I hope Uncat's first order of business is to hang her in ep10. definitely, they need to build something up for this episode. non-book readers don't even care about Robb. I'm putting my money on her dying. If only for the reason brought up earlier: less of a presence of Grey Wind this season, so we need another major death or two to really crank up the misery of the RW. And we're not getting enough bannermen. We're already at the point in the season where introducing a token bannerman will just come off as introducing a red shirt in Star Trek. Even still, I've been thinking about the idea that she's been planted by the Lannisters* to inform on Robb's plans and movements, ever since that scene a few episodes back where she was helping clean up those two young Lannister boys that Edmure captured. On one hand, it's a little soap opera-y. On the other hand, it's interesting to see what role she can play in the RW. Especially if she's revealed to be Jeyne Westerling all along! Also: for how little happens with Jeyne in the books after the RW, I really don't think making Talisa a hostage holds a lot of ripe storytelling possibilities on the show. Unless they want to add something completely wild and new to the plot. * Think of how quickly Lord Tywin knew about the Karstarks leaving in episode 5. There's either an unseen spy or a scout (which is reasonable, as its not like we often see LF and Varys' spies, but adds little drama to the TV medium), or someone is informing to Tywin. ^The Karstarks leaving isn't really a sign of a spy in Robb's camp. It's an entire army upping and leaving, you can't really hide that. I'm guessing the show kills Talisa at RW. As to Tywin already knowing about the Karstarks leaving, I'd venture to say that Roose has already switched sides. 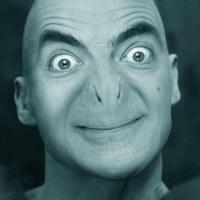 Or it could be Talisa. Who knows?